The Tiny Blue Butterfly: Geo Birthday! this looks really interesting, I just want to touch it! 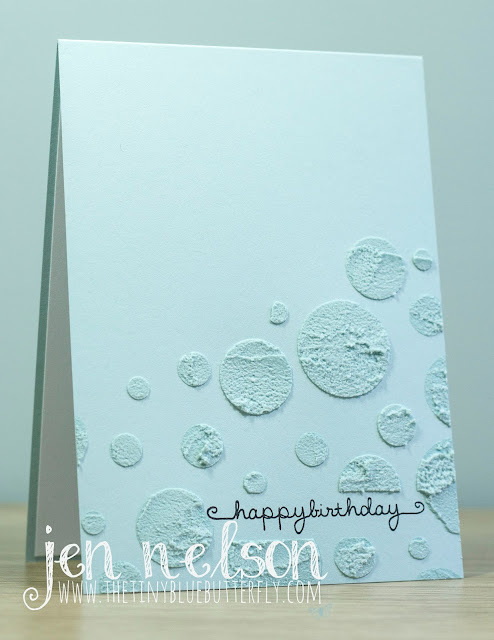 Love the look of your card, Jen, and all the texture! Wonderful texture and love the clean space for balance. Great work!! Don't you just love working with molding paste. So fun! Thanks for joining us at Less is More! This is fabulous, I love the texture you've got with the paste. Gorgeous embossing with the paste!! I've never tried this technique but I think I will go and get me some embossing paste and give it a try. Love the colors, so soft and beautiful. I love the texture and contemporary feel of this card. Great layout and so pleasing to look at! I just love the simplicity Jen and the texture looks so tactile! Jan that's a great textural card !! Gorgeous card Jen, love all the texture. Fabulous OLC, Jen. Love the simplicity yet lots of texture.